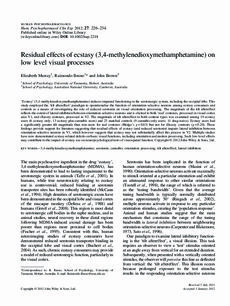 Copyright 2012 John Wiley & Sons Ltd.
‘Ecstasy’ (3,4-methylenedioxymethamphetamine) induces impaired functioning in the serotonergic system, including the occipital lobe. This study employed the ‘tilt aftereffect’ paradigm to operationalise the function of orientation-selective neurons among ecstasy consumers and controls as a means of investigating the role of reduced serotonin on visual orientation processing. The magnitude of the tilt aftereffect reflects the extent of lateral inhibition between orientation-selective neurons and is elicited to both ‘real’ contours, processed in visual cortex area V1, and illusory contours, processed in V2. The magnitude of tilt aftereffect to both contour types was examined among 19 ecstasy users (6 ecstasy only; 13 ecstasy-plus-cannabis users) and 23 matched controls (9 cannabis-only users; 14 drug-naive). Ecstasy users had a significantly greater tilt magnitude than non-users for real contours (Hedge’s g = 0.63) but not for illusory contours (g = 0.20). These findings provide support for literature suggesting that residual effects of ecstasy (and reduced serotonin) impairs lateral inhibition between orientation-selective neurons in V1, which however suggests that ecstasy may not substantially affect this process in V2. Multiple studies have now demonstrated ecstasy-related deficits on basic visual functions, including orientation and motion processing. Such low-level effects may contribute to the impact of ecstasy use on neuropsychological tests of visuospatial function.